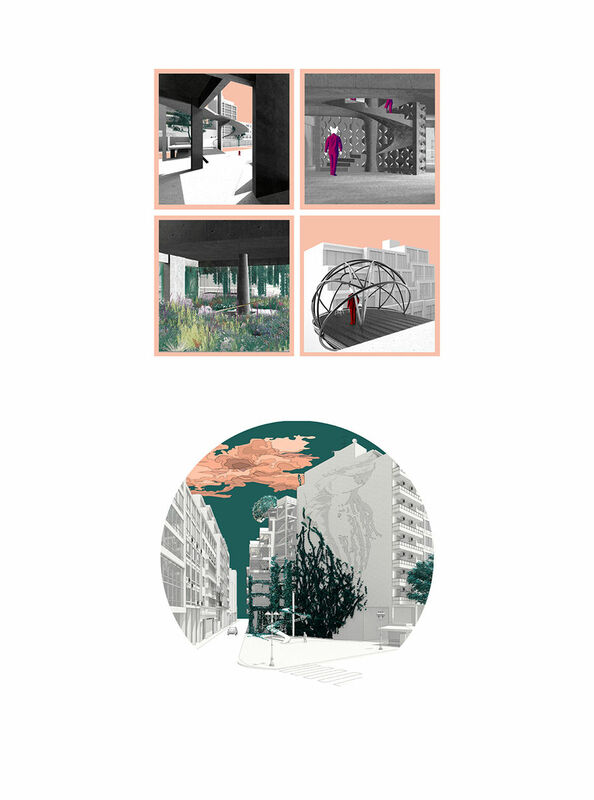 The design thesis Mock ruins-/+ by Christos Montsenigos and Eleni Skevaki focuses on four unfinished buildings and their transformation into vertical gardens. 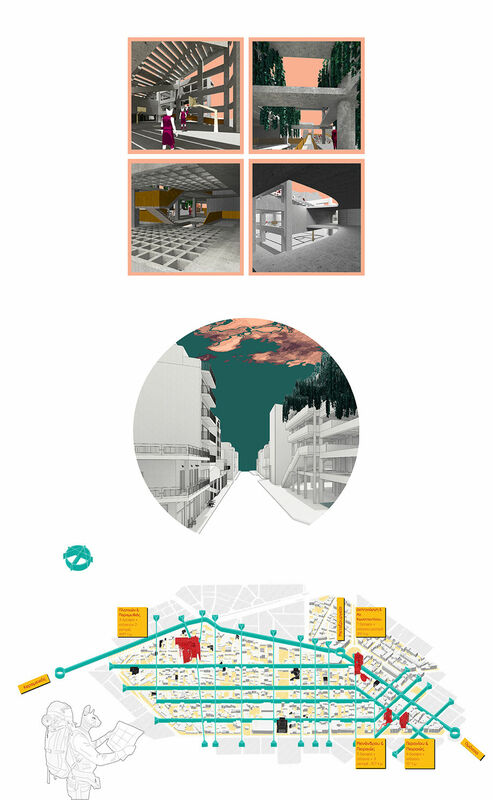 It was presented in July 2017 in NTUA School of Architecture. 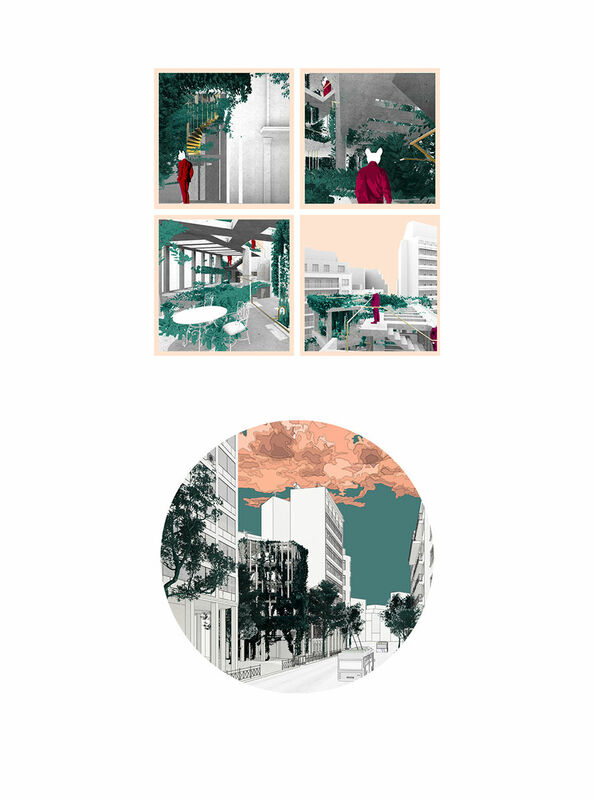 The thesis expands upon the notion of architectural heritage by focusing on four unfinished buildings and their transformation into vertical gardens. 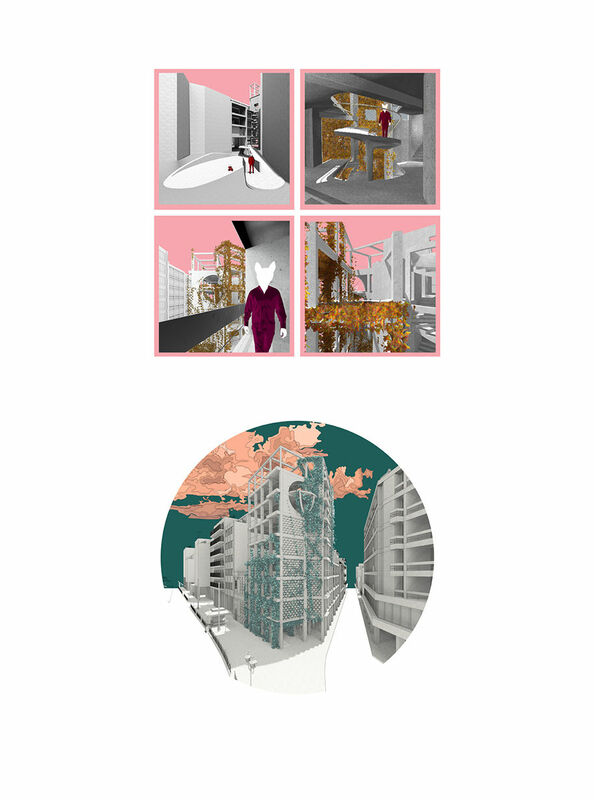 The buildings are chosen from a wider corpus of unfinished constructions in the center of Athens, and are then submitted to actions of subtraction and enhancement of their structural frame. Most of the buildings could not have been erected under contemporary legislation, which further enhances our statement that they are trapped in an in-between state. 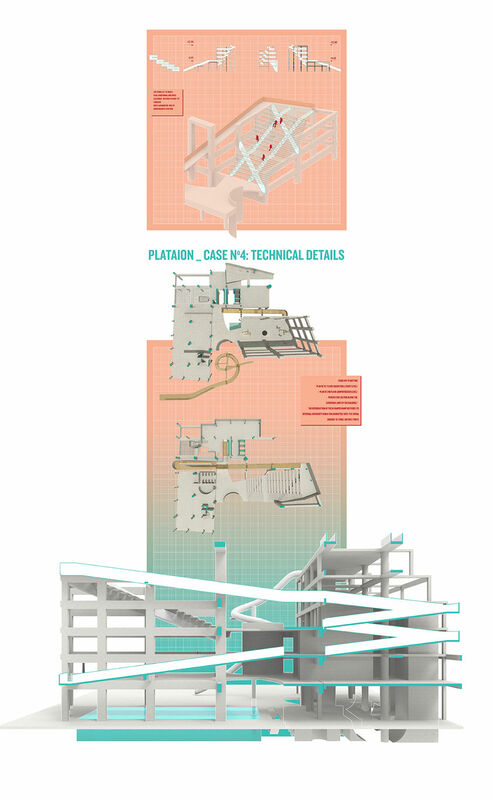 Contrary to a “traditional finishing” of the structure, our intervention aims to further “relieve” them. The four buildings are arranged from smallest to largest, each one more complex than the one that came before it in terms of scale but also richer in terms of program. Nature reverses the very notion of decay, constructing lush, botanic scenery out of formerly restricted enclosures. The four vertical gardens being produced should operate together, taking the shape of climaxing urban episodes or hybrid structures oscillating between City and Nature. 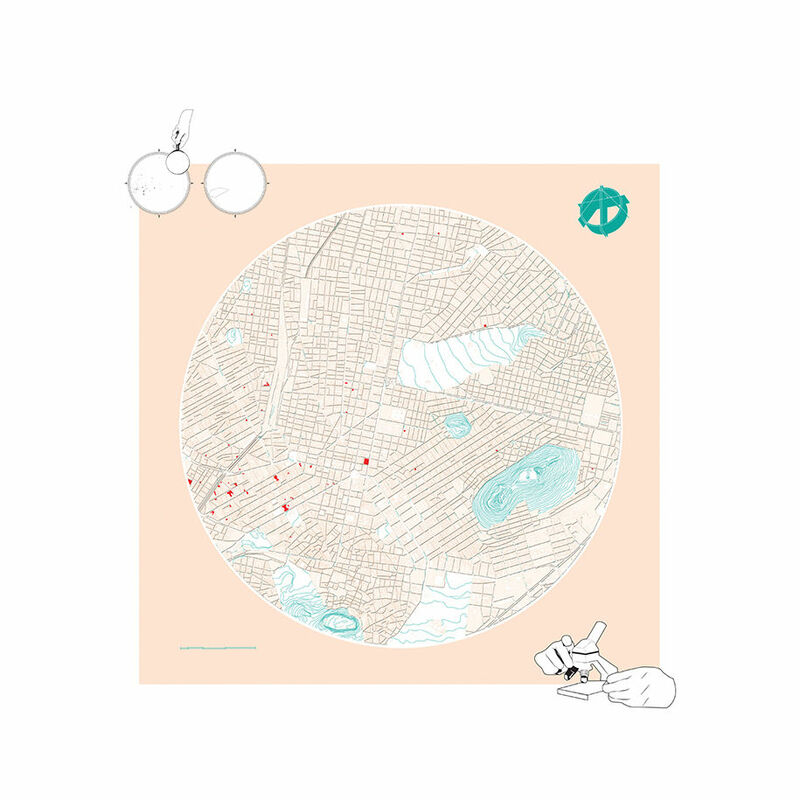 The first building consists of two zones angular to each other, that create immediate views towards the interior of the building and the city. The non-typical arrangement of the slabs after the subtraction accentuates visibility transforming the building into a three dimensional frame taken over by climbing plants. The building’s corner is remodeled into split-level sitting rooms hovering over the city in a diagonal distribution of the void. Case number two is a narrow seven-floor structure with three additional top-floor apartments next to an open parking lot. 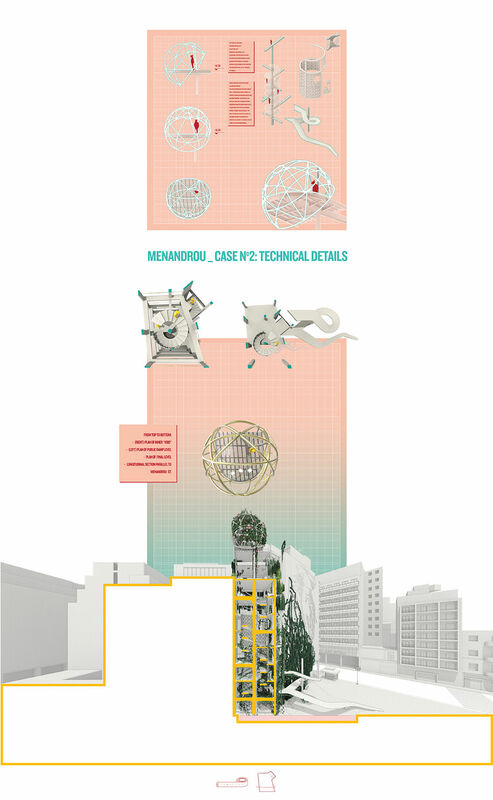 The proposal maintains the primary goal of overturning typical floor arrangement while emphasizing the buildings latent verticality and reinterpreting the structure’s spatial proximity to the open lot. The central, vertical void is filled with a spiraling movement leading all the way up to the last floor where a spherical, metallic umbrella, taken over by vegetation, gives shapes to a garden observatory. The two-building complex’ s system of beams provided the ideal frame for the plants to develop. The central core of the building’s slabs is fully subtracted creating an enclosed atrium. A diagonal axis cuts through both buildings in the shape of ramps. The complex’ s last floor is remodeled into a viewing platform gazing over the city, organized around the central element of a circular occulus. At ground level a system of ramps, stairs and thin corridors sits on top of the soil connecting the two buildings with surrounding spaces and the rest of the neighborhood. 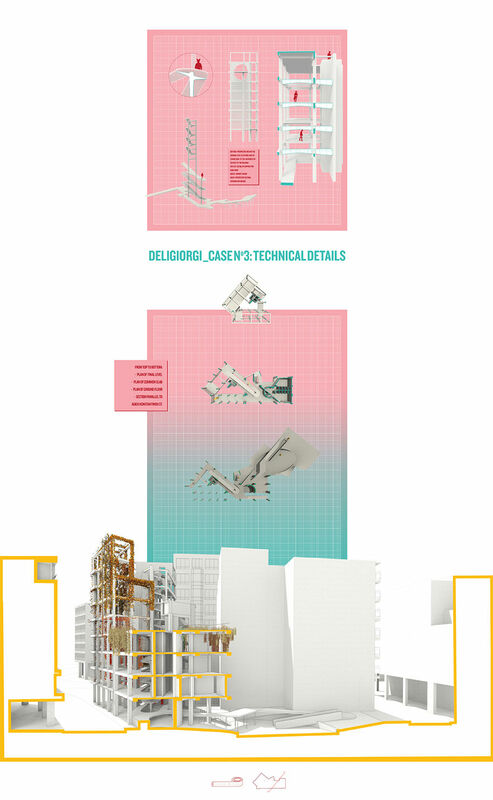 The main subtraction expands the existing anti seismic joint situated between all three of the buildings of the complex, creating three separated volumes. The new void is filled with an M-shaped ramp that restores and alters the interior circulation between them. At the heart of the complex, a large interior void is created, newly sheltered by a feather-like amphitheater, seemingly parallel to the sunlight’s angle, located at the upper end of the aforementioned ramp’s development. 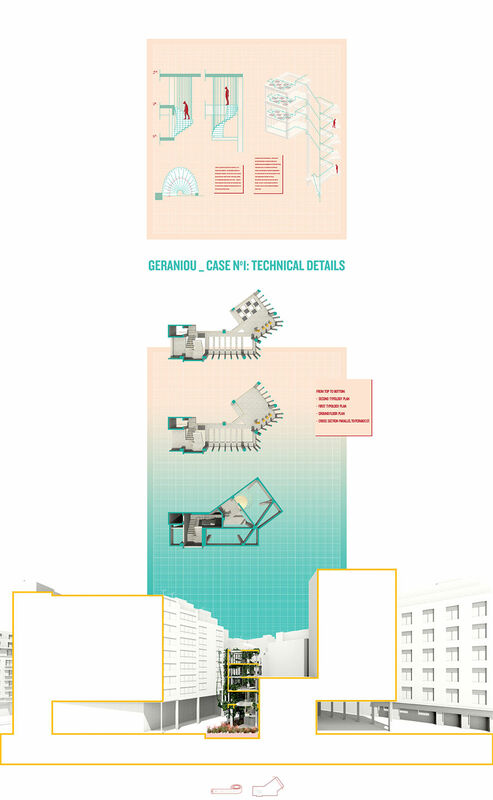 See Also Saladi Beach Hotel: Transformations of the ruin | Thesis by Gelali Th. & Stathatou D., here!